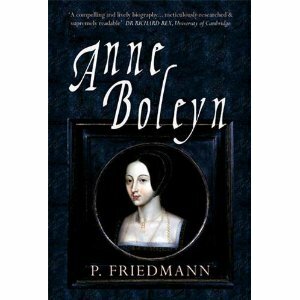 This month I have chosen “Anne Boleyn” by Paul Friedmann as our Book of the Month. It is actually a very old book, having been first published in 1884, but Amberley Books got historian and author Josephine Wilkinson to edit it and have just this month (May 2010) republished it. “Friedmann’s ANNE BOLEYN is a meticulously researched and supremely readable classic of Tudor biography, still required reading more than a century after it was written. Friedmann has an unparalleled mastery of the detail of his subject, which he weaves into a compelling and lively narrative.” –Dr Richard Rex, University of Cambridge and author of “Henry VIII: The Tudor Tyrant” and “The Tudors”. The classic biography of the most engaging of Henry VIII’s wives. Anne Boleyn entered Henry’s life just as he was seeking to discard his wife, Catherine of Aragon, for failing to give him a son. Henry courted Anne, but she refused to yield to his advances until he promised her marriage. At that moment, Anne was his. Driven by his love for a woman who refused her sexual favours unless she was certain of becoming queen, Henry took on the might of the Catholic Church, challenging papal authority as he strove to divorce Catherine and marry Anne. The process, urged on by Anne and her increasingly powerful family and supporters, cost the lives of many great and powerful men as, one by one, Wolsey, Fisher and More, went to their deaths. While Henry became the head of the church in England, supported by ambitious ministers and a pliant archbishop, his country faced invasion as the pope, King Francis and the Emperor Charles in their turn threatened the king who now stood isolated in Europe. Friedmann charts the rise and fall of Anne Boleyn, from her origins as the daughter of a gifted and ambitious courtier, her elevation to the greatest heights a woman could reach, to her tragic fall and execution, the victim of the man who had once loved her, and who had altered the course of his country’s history forever in order to have her. This two volume biography of Anne Boleyn was re-issued on the 10th May 2010 and is published by Amberley Books. It is available from Amazon UK, Amazon US or your usual book supplier.